Compliance online training has the potential to be the star of your eLearning catalogue. That might surprise you. But in designing compliance training materials, there is every opportunity to create an immersive environment. And you will surprise your learners too. Read this guide to find out how to create a compliance-aware culture through effective eLearning. Design a comprehensive compliance strategy. The first thing to realise is that compliance shouldn’t be a reaction to an issue: it should be part of an organisation-wide set of values to act ethically and with integrity. Whether you are covering harassment, discrimination, data protection or financial compliance, your approach to maintaining high standards through online training should be consistent. Research your audience. Take the time to survey, interview and run focus groups with your learners. Get to know their learning styles; conduct a training needs analysis. Understand their experience, and how they will respond to different design elements. Your content and design will then be targeted towards this set of users and their particular requirements. Totara Learn LMS lets you deliver tailored content by using the organisation and position hierarchy to target specific groups. Set and track learning goals. Use your LMS to create individualised learning paths to put the training in context and help to set expectations. Totara Learn LMS allows you to set up individual learning plans based on job roles and associated competencies. This will help your learner understand what’s expected of them throughout the compliance programme – especially important if there are multiple related courses. Adopt a mobile-first approach. Use a responsive interface to encourage anytime, anywhere learning to engage learners. Set the context for mandatory training. Use your surrounding communications to set out why compliance is both essential and beneficial. Context is everything when it comes to learner motivation. If you want learners to adopt new behaviours, they need to understand where they are going wrong and why they should change. Established desired behaviour change. Be very clear about the desired behaviours learners should adopt. Detail clear objectives from the outset and refer back to track progress throughout. Certification, rewards and badges provide a sense of accomplishment which encourages ongoing participation as the learner progresses. With Totara Learn, you can also vary the assessment methods you are implementing so that tracking progress doesn’t feel like constant testing. Don’t overwhelm the learner. Break the content down into modules and provide lots of breaks to keep the learner’s attention. The worst thing you can do is use extended blocks of text, or even long videos or animations, without pausing for thought. Design targeted modules so that learners are receiving content that is suitable for their job role. If they don’t understand the content, or they don’t feel it is relevant, learners will disengage. Set your learning in the real world. Use real world examples wherever possible to illustrate more complex concepts. Use interactive elements, visuals and infographics wherever possible in place of text. If your learner is able to imagine how they would respond in the real world, it will help them adopt their new skills when they are back on the job. Vary the delivery. Games, simulations and branching scenarios keep it interesting and motivate the learner to continue to engage – not just complete. Ensure characters and settings in visual elements are varied, too. This is the area that will be most dictated by all that learner research you did up front. Compliance training can succeed or fail on the strength of the creativity of the design elements employed. Use stories to engage the learner. Stories capture the attention, trigger the memory and help learners make an emotional connection to the topic. They help make complex concepts easier to understand. Try using humour in small doses to lighten the tone where appropriate. Use real-world stories and break them up with questions and decisions so the learner gets some feedback. Keep content fresh and up-to-date. Dedicate resources to ensuring your materials and content are demonstrating the latest tools and content. Totara LMS helps you to centralise all your compliance resources to ensure you can effectively direct further reading, analyse previous experience, and link to additional materials. Learners are quite capable of identifying out-of-date policies and approaches – and your reports will tell you that participation and scores are suffering as a result. Microlearning is an essential part of compliance training. Not everyone needs a full online Compliance course. Microlearning provides an opportunity for everyone to learn at their own level. A Microlearning library allows learners to access relevant assets that interest them and support their own learning goals. They help take the mandatory training and transfer it to the self-registration approach which appeals to learner motivation. You can support compliance training with effective communications including follow-up microlearning. Use your reporting tools to identify learners that need additional or refresher training. Don’t be afraid to apply your design repertoire to compliance training. Just because it doesn’t appear to have as many creative options as sales or product training, there’s still plenty of scope for creating an immersive experience. 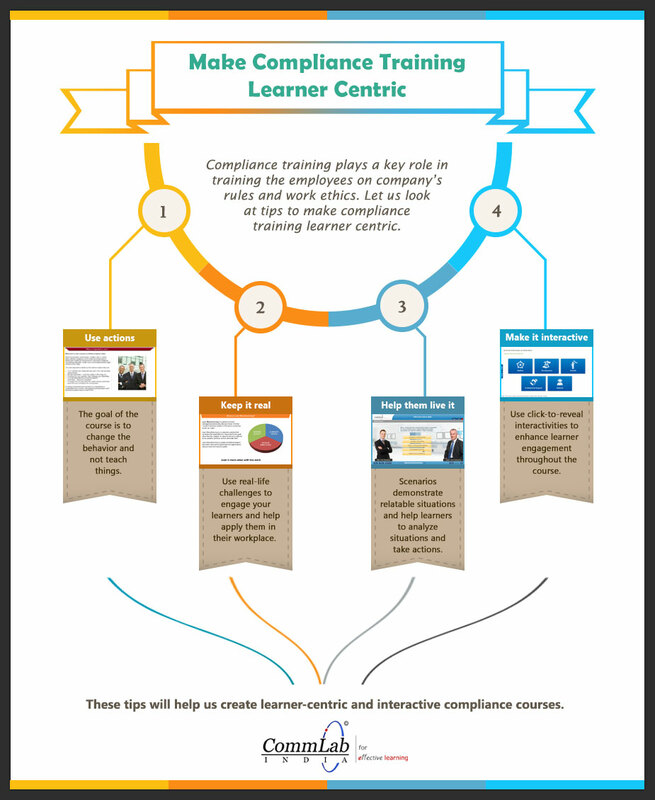 Here’s an easy infographic to help you remember the top priorities when designing compliance training. It’s all about bringing content to life, and engaging the learner in the process. Don’t feel obliged to keep a formal tone throughout – you’ll lose the learner’s attention. Apply light and shade in your design: a little real-world experience, a little use of games. 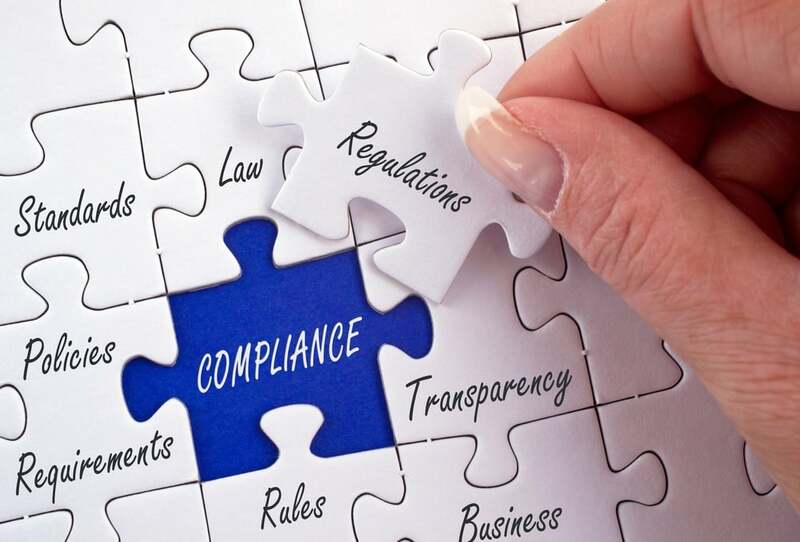 Run your compliance training as part of an overall strategy to create an ethical culture and make sure everyone is on board. Keep clarity in mind, and you’re ready to go.